Photo courtesy of @aliciarosemoore/La Colombe. Bids for Amazon’s $5 billion HQ2 are due tomorrow (that was fast! ), and Philadelphia has really cranked up the wooing this week. Coffee shops like La Colombe have taken things to another level. Think latte rosettas are impressive? Try 3-D printed lattes. 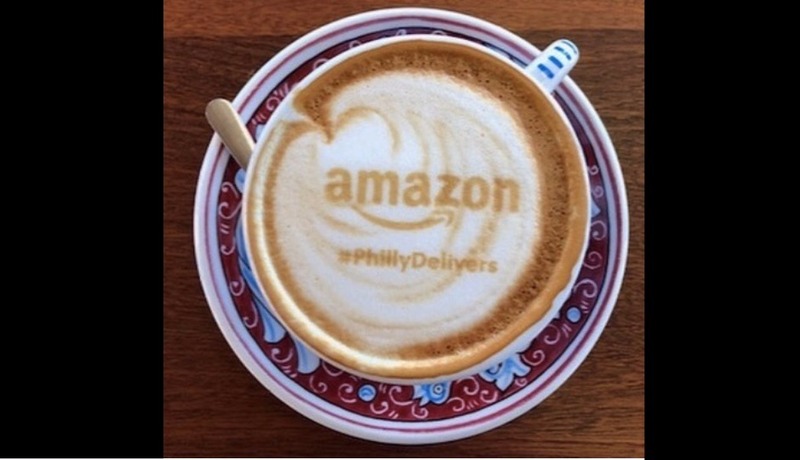 Today, the company’s Independence and Fishtown cafes are featuring the special Amazon design. Quaker City Coffee jumped in with some coffee bean action. On Thursday morning, Philadelphia will officially submit its bid. If you’re wondering just how many people were involved in the effort, the city’s Amazon HQ2 coalition says more than 200 leaders in the region’s business sector, including 76 from the startup community, as well as more than 65 college and university presidents signed letters of support or provided testimonials. In addition to Wharton’s pitch competition, 170 students shared insight on talent attraction in a Campus Philly survey. Various business organizations participated in weekly calls and gave feedback on the city’s proposal. City Council signed a resolution to encourage Amazon to choose the city and Governor Wolf and state representatives made pitches for all of Pennsylvania’s cities and towns.